The CWCB Board and staff love to get out and see our state's natural resources firsthand, and we got to do just that at our May 2018 Board meeting in Salida. The Upper Arkansas Water Conservancy District took the Board and staff on a bike tour and hosted a reception to mix and mingle with the community and hear about local projects in the Arkansas River Basin. 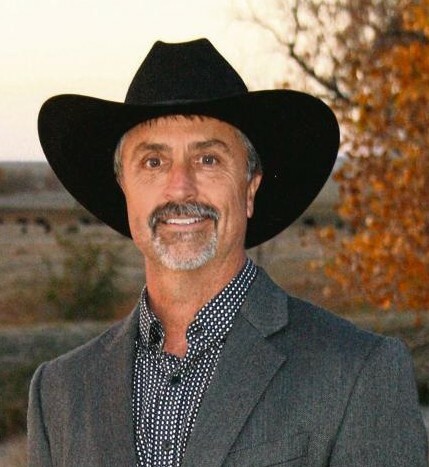 At the May meeting, the CWCB welcomed two new Board members: Curran Trick representing the North Platte Basin and Steve Anderson representing the Gunnison Basin. Please join us in welcoming them! And, we want to thank Ty Wattenberg and John McClow for their steady support of our state's water resources as they finished their Board service. The South Platte River Basin has been implementing Alternative Transfer Methods (ATMs) for over 25 years according to Jim Yahn, Chair of the CWCB Board and South Platte River Basin representative on the Board. Why? He says, "just because they made sense." Learn more in his article that takes a deep dive into ATMs. Alexander Funk is the new Agricultural Water Resources Specialist in the Interstate and Federal Section. 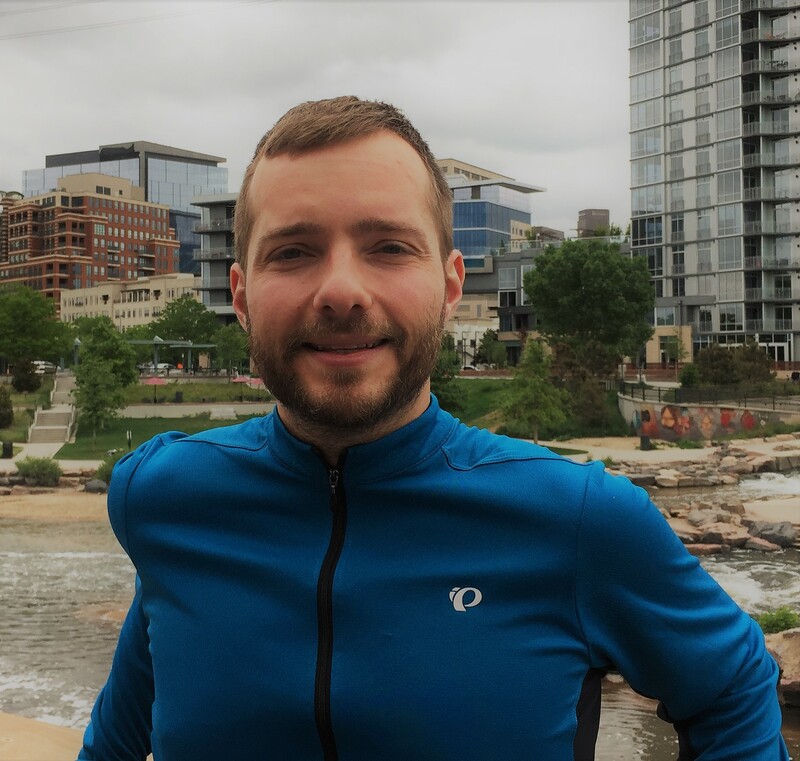 Alex will serve as a liaison to Colorado’s agricultural community and manage the CWCB's Alternative Transfer Methods Grant Program and Colorado’s Water Plan Grants that further the plan’s agricultural viability goals. Alex previously served as the Western Policy Director with the National Young Farmers Coalition where he focused on federal and state policy issues concerning western water management, drought adaptation, and other challenges affecting next generation farmers and ranchers. Alex also was the Lapham Conservation Fellow with American Rivers where he worked with Colorado ranchers to develop projects improving irrigation systems and enhancing river health. Alex received his bachelor’s degree in Environmental Policy and Planning from Virginia Tech and his Juris Doctorate degree from Vermont Law School. In his free time, Alex enjoys mountain biking, backpacking, and climbing. 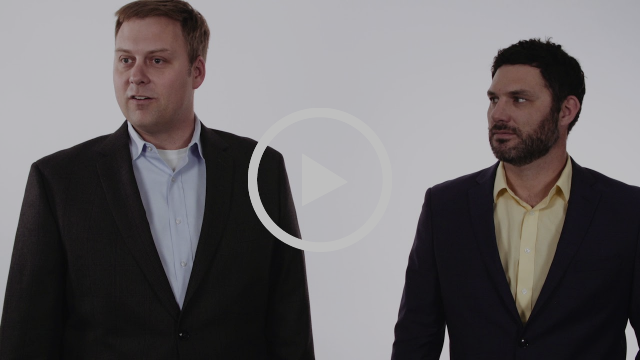 On April 19, the five Trout Tank H2O finalists pitched in front of an audience of 140 people representing the business, entrepreneurial, and water communities. RenewWest won the Judge's Award and the $5,000 prize provided by Denver Water and Colorado State University. Running Rivers was voted the People's Choice Award and received "free beer for a year" from MillerCoors. Check out the press coverage and videos from the event. Thanks to the amazing partners, judges, and all 12 Trout Tank H2O participants for supporting the first-of-its-kind water-focused accelerator in Colorado. 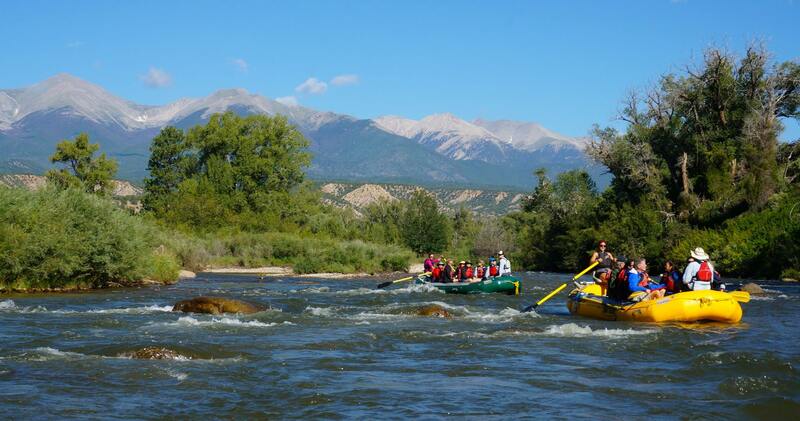 This hour-long documentary about the Arkansas River from Leadville to Lamar explores the economic and social importance of the river including its recreational, municipal, and agricultural value. By the year 2050, the population of Colorado is expected to double. But future growth and economic development hinges on a dependable water supply. This documentary educates and inspires viewers to care for this critically important resource. The program aired on Rocky Mountain PBS on Thursday, May 31. Watch the documentary. 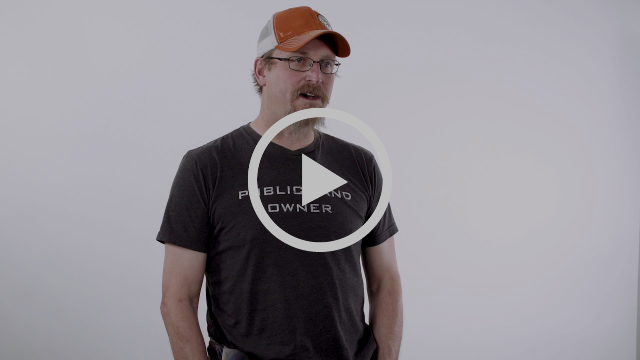 Colorado Trout Unlimited, whose mission is to conserve, protect, and restore Colorado’s rivers, partners with the state to offer a Protect Our Rivers license plate to support Colorado rivers. The program has a target sales goal to hit, so check it out to keep our rivers healthy! 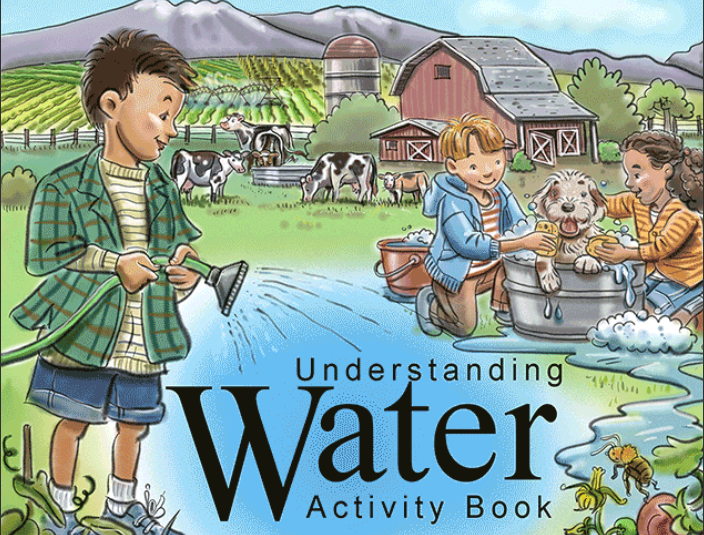 The Colorado Water Plan Grant fund helped fund the Understanding Water activity book, a project of the Colorado Foundation for Agriculture.This volume introduces basic water concepts, such as supply, uses, water treatment, pollution, conservation and wastewater treatment. The intent of this activity book is to help prepare knowledgeable decision-makers. Check it out for free. Water your lawn with rain water! 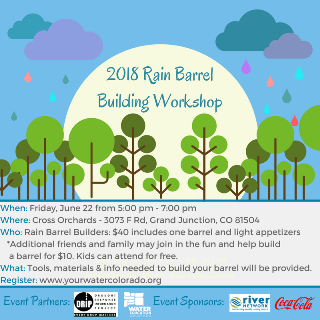 Join Water Education Colorado and the Drought Response Information Project (DRIP) in Grand Junction and build your own rain barrel! This year's regional Watershed Summit (SHED '18) is going to be better than ever! With over 200 water utility executives, business leaders, conservation experts, and other professionals coming together and sharing tested solutions, you will surely come away with new insights and ideas to help position your organization for success. 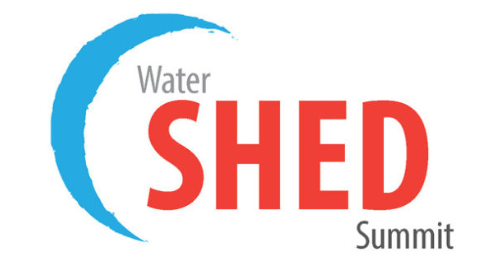 The Watershed Summit is produced through a collaborative partnership between the Colorado Water Conservation Board, Denver Water, the City of Boulder, the One World One Water Center, Resource Central, and the Denver Botanic Gardens. Learn more and register here. 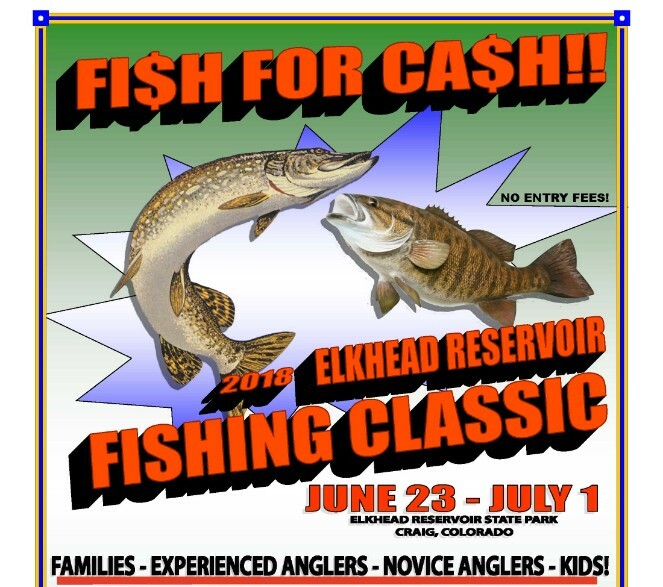 Fish for cash at the 2018 Elkhead Reservoir Fishing Tournament. This tournament will target smallmouth bass and northern pike. Get more information. Do you like to run? Fish? Drink beer? Then, the Rocky Mountain Flyathlon is for you. 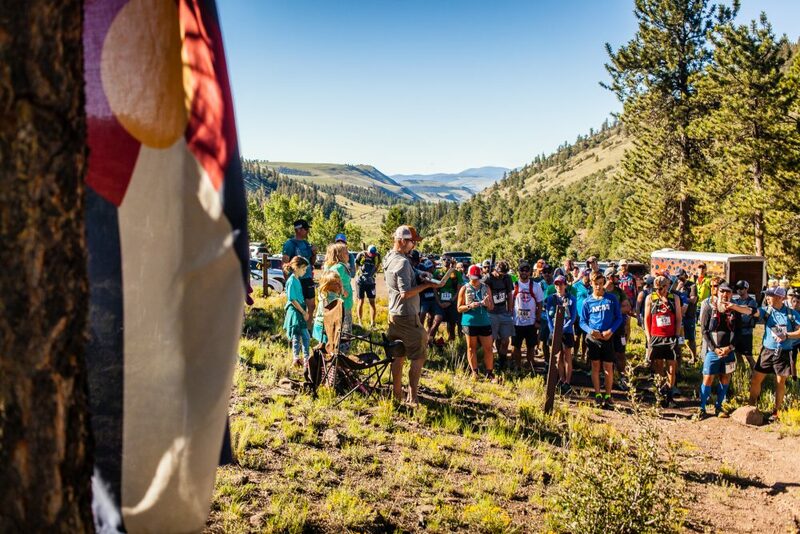 The Rocky Mountain Flyathlon seeks to inspire responsible outdoor participation and work towards building stronger local communities. The goal is to connect people to our spectacular trails and waters that need to be protected, maintained, and in some cases, reclaimed. Check out the 3rd Annual Lake Fork event and The Dirtbag Diaries podcast highlighting the program.